That said, I thought it would be fun, with five full years gone, to see how Bucci did, and try to build a prediction model with the same data he had available. It stands to be said, first off, that Bucci’s projection was very arbitray, including a 71-season (because “He’s got to have one monster season”…nevermind that he had already had a 65-goal season and a separate 528-shot season). The bulk of the projection relied on loose historical comparisons, with most of the season projections justified by previous performances of great players like Steve Yzerman, Wayne Gretzky, and Phil Esposito. Focusing first on the subsequent five seasons, he projected Ovechkin to score (starting in 2010-11) 71, 66, 60 (pro-rated to 35 for a 48-game schedule), 51, and 55 goals. Overall, he predicted 278 goals for those years, while Ovechkin scored 206 — an accuracy of 74%. Instead of cherry-picking — which can be problematic if you’re working with counting totals — I decided to take Ovechkin’s three seasons leading up to 2010-11 and carry over the average and variance in goal-scoring and ice-time per 60 minutes, as well as games played. I adjusted the underlying average to match Eric Tulsky’s aging curve, wherein scorers gradually dip down to 90% of their peak scoring by age 29. Then, I randomly generated the variance over five seasons and applied the adjustments to the curve. I did this for 5v5 even-strength, powerplay, and shorthanded situations…the residual goals and ice-time were so random I simply did the same random generation for residual goals, rather than break it down to the infrequent ice-time situations. Note: The “age” for the season is by Buccigross’s definition; most sites would have 2010-11 and onward as 24, 25, 26, etc. Both approaches were overly optimistic, but while the statistical projections were tempered by averages and variance, Bucci just had to believe Ovechkin could do something incredible — even though Ovechkin already did — and his projection suffered for it. For our part, it is pretty impressive to capture 87% of five years of goal-scoring in a projection, considering how fickle shooting percentage can be. The astute observer will note that our projection misses a season’s worth of goals (32)…though it’s not nearly as bad as Bucci winging it and missing 72. It’s worth noting our very random residual goals add up to roughly make the 32-goal difference…but I don’t think excluding them would’ve been fair to the method. All things considered: without a serious injury, and even in the case of an identifiably great player, we’re getting a good idea of our ability and limitation in projecting greatness into the future. For fun, I want to do the same exercise to compare our projections to Bucci’s for the remainder of Ovechkin’s career. We already know Bucci suggested Ovechkin could surpass Gretzky — assuming Ovechkin makes it to age 40 in the NHL, does our projection suggest the same? Well, first of all, I can’t just apply the same projection I did above; I need to consider more aggressive decay rates for even-strength and powerplay time on-ice through Ovechkin’s 30s. 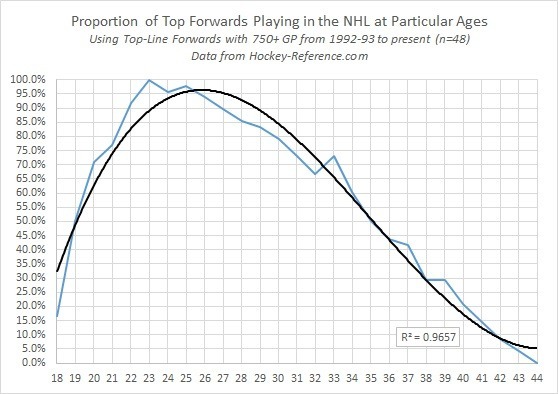 To do this, I used the same progression I developed for this GIF of the evolution of a typical forward’s ice-time, with one caveat: I applied the same curve for even-strength time and powerplay time for Ovechkin. 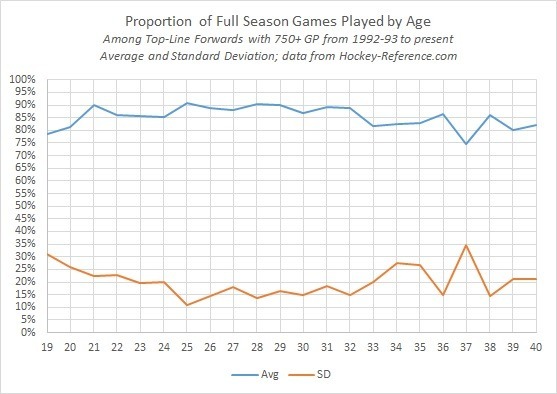 Unlike the rest of the forward population, powerplay specialists tend to retain their powerplay time into advanced age, so I’d rather apply the fatigue-and-overall-skill influenced even-strength deployment curve in this case. 2015-16 30 27.4 15.1 1 7 50 48 ? 2016-17 31 24.6 14.6 0 5 44 52 ? 2017-18 32 23.0 12.3 0 6 41 45 ? 2018-19 33 21.5 12.1 0 7 41 55 ? 2019-20 34 25.0 12.2 0 8 45 40 ? 2020-21 35 23.8 12.1 0 2 38 37 ? 2021-22 36 20.9 15.2 0 5 41 32 ? 2022-23 37 19.2 12.5 0 6 38 40 ? 2023-24 38 22.1 11.6 0 0 34 32 ? 2024-25 39 21.8 10.4 0 2 34 28 ? 2025-26 40 17.4 9.8 0 2 29 27 ? From that initial starting point, Buccigross projected 714 goals for Ovechkin, while our (admittedly optimistic) model returns 674. Keeping in mind the target Bucci and the NHL would set for Gretzky’s record (894), his projection has Ovechkin ending with 983 goals. Our model would put him at 943 goals…though if our model continues to be optimistic at the rate it was for the first 5 years in the projection, we might be smart to shave the 6.4 goals per year error off the subsequent 11 years — putting Ovechkin at 873 goals. In all those scenarios, presuming he makes it to 40, he has a pretty good shot. This is the percentage of those players still playing at each age. 15% of the players in this model make it to age 40; even worse for Ovechkin, only 40% of that group entered the league at his age or younger. That puts Ovechkin’s odds at less than 6% likelihood of realizing any of our career-goals projections above. So, despite the enthusiasm we’ve seen from some more-recent posts, projecting Ovechkin to have a full, proficient NHL career to age 40 should be taken with a boulder of salt. That said, I would like to see him reach it. Objectively considering his performance and league difficulty, he is the most talented player in NHL history, and I think there are some traditionalists who would unfairly deny him for these numbers. Topping Wayne Gretzky in goal-scoring would remove a lot of doubt.